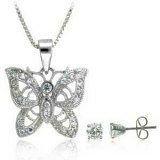 Butterfly Jewelry - Necklaces, Pins, Bracelets, Belly Navel Rings, Earrings, Charms, Anklets and Toerings and watches featuring a butterfly design. 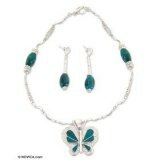 Butterfly Jewelry - Necklaces, Pins, Bracelets, Belly Navel Rings, Earrings, Charms, Anklets, Toerings and Watches. 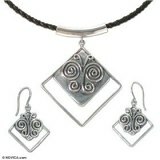 The jewelry featured on this site is available from a range of fine jewelers and merchants through the Amazon.com program. I have researched and categorized the pieces, to create this butterfly collection for your shopping convenience. Anklets and Toe Rings - a small variety of ankle bracelets and toe rings that feature a butterfly design. 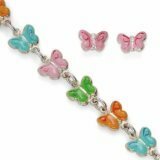 Bracelets and Charms - a nice selection of bracelets and charms featuring butterflies. Belly Navel Rings - Butterfly themed rings for your belly navel piercing. Pins - A nice selection of fine jewelry, as well as several pins available for under $25. 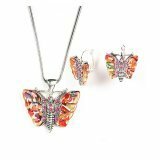 Necklaces and Pendants - I have just completed categorizing a range of butterfly necklaces and pendants. 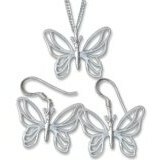 Earrings - I have just completed categorizing butterfly earrings in all prices. Rings - I have added some fine quality rings, with plans to add a selection of fashion rings in the near future. Watches - a small selection of watches that feature a butterfly design.